Are you on the right track? On deliveries are possible only. Just blend and you're done! Let someone else do the chopping. Enjoy a smoothie in just 30 seconds. You're in the mood for a smoothie. But not for spending 20 minutes chopping vegetables? With our Smoothie Balls you can whip up your favourite smoothie in just 30 seconds. With ingredients that taste garden-fresh. Veggie green, fruity purple or nutty yellow. On its own, with milk or with coconut water. Or add your favourite fruit. Just the way you like it. Simply blend, and that’s it! Being healthy has never been so easy. The quickest smoothie you have ever made. Simply throw your Smoothie Ball in the blender. When you want something more, add your favourite fruits or vegetables. Blend with milk or coconut water according to your taste. Done. Chia seeds meet acerola and Jerusalem artichoke. 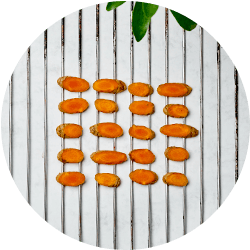 Refined with exclusive flower pollen and a touch of turmeric - ginger's sweeter cousin. Lightly spiced. Subtly sweet. With an extra note of freshness. Naturally organic quality and no additives. Because sometimes less is better. We'll do it for you. 1. Our fruit and vegetables are gently dried. 3. Mixed with dates and cashews. 4. Et voilà: Formed into balls. *In accordance with the law. 3. 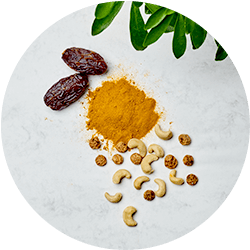 Blended into a mixture with dates and cashews. Fruit balls with plant powder for making smoothies. Contains 5 portions (5 x 25 g). May contain traces of other nuts, sesame seeds and ground nuts as well as husks and pips. That is how we like it best. Break the banana into small pieces. Put all ingredients into the blender. Blend quickly on the highest setting. If you have a lower-powered blender, first mix on the highest setting. Let it sit for around 30 seconds and then blend again for 30 seconds on the highest setting. That's how your smoothie gets deliciously creamy. 1 Smoothie Ball Purple, 1 small ripe banana, 100 g frozen raspberries or forest berries, 300 ml milk or milk alternative. Leave reviews for our finest fitness food in your user account. No reviews available in English yet. Green, purple and yellow. 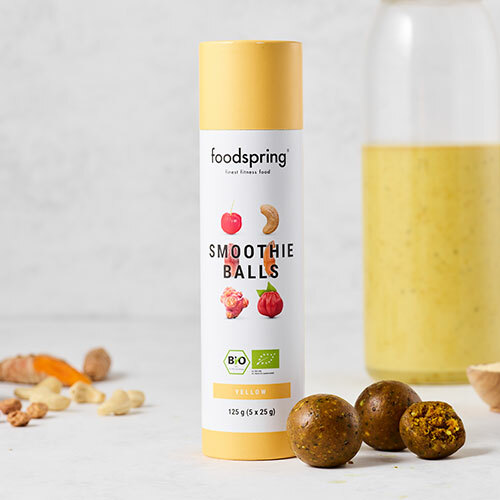 foodspring Smoothie Balls revolutionise your smoothie. And all in under 30 seconds. They will quickly become your favourite smoothie. How? It’s simple. Throw the balls into your blender. Add milk. Your smoothie is done. A freshness kick that's always good. Without all the shopping, washing and chopping vegetables, cleaning the kitchen and everything else involved. Have them for breakfast, after a workout or as a quick snack between meals. Each foodspring Smoothie Ball is packed full of quality organic ingredients. So what don't they have? Sugar, flavourings, chemical additives. For our Smoothie Balls we use high-quality, carefully selected organic ingredients with the quality of raw food. They are gently processed so they still contain all the nutrients your body needs. We know how important it is to maintain the raw food quality of the original ingredients. That is why they retain their heat-sensitive vitamins. Smoothies are the ideal nutrient kick between meals. The problem: They take a lot of effort to prepare. You have to buy fruit and vegetables, wash them, dice them and then clean up the mess afterwards. This can quickly add up to half an hour of work. But not any more - thanks to our Smoothie Balls. If you are mixing the ball with milk, a plant-based milk alternative or juice, it will take you just 30 seconds. Rinsing the blender makes it maybe a minute. Best of all: Although our Smoothie Balls make your smoothie quicker to prepare than ever before, they taste super fresh and also contain plenty of vitamins and nutrients. That is because we use gentle processing for the organic ingredients in our Smoothie Balls to preserve their raw food quality. How are these balls made? Imagine this: The vegetables, spices and fruit that go into our balls are dried and ground to fine powders. Then they are mixed with dried dates and cashews, formed into small balls and gently dried and packed. Done. Of course you can do more with our Smoothie Balls than simply mixing them with milk. They are suitable for a variety of smoothie recipes. The only limit is your imagination. For example: with banana. It gives your smoothie an additional sweetness and makes it deliciously creamy. Use green vegetables for green smoothies. For example: frozen spinach. Then you don't need to buy it fresh or cut it up. Apples or ginger are also great in green smoothies. For a purple smoothie, pretty much anything in the same colour range will suit. Add some strawberries, raspberries, blueberries, and even a small piece of beetroot, and combine this with a banana to create an even fruitier smoothie. 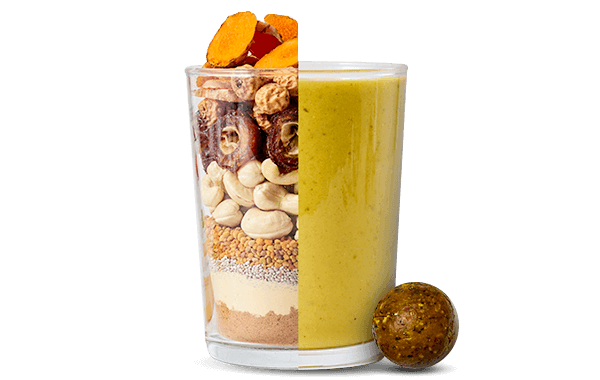 Yellow Smoothie Balls contain tiger nuts and turmeric which give them a very nutty and spicy flavour. They will taste great when combines with peanut butter, banana and almond milk. The fewer unnecessary additives a smoothie contains, the better it is. One common problem with store-bought smoothies is that they are made primarily of concentrates. Which means that they contain a lot of concentrated fruit sugar. 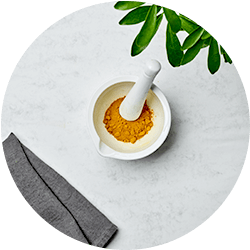 A better alternative is to use whole ingredients - for example in powder form. More of the nutrients and valuable dietary fibre are kept intact. Flavourings, sugar and artificial additives also have no business in smoothies. Organic and raw food quality means gentle processing and maximum benefits for you. What are the advantages of smoothies in a spherical shape? There are so many! They taste garden fresh. They are full of good ingredients. There's no washing or chopping before you blend. They won't go bad in a few days. In short: You have all the advantage of a fresh smoothie. But without the work. Can you mix Smoothie Balls in any kind of blender? Yes, with any regular blender or personal blender. Depending on how powerful your blender is, your Smoothie Balls will be ready in a flash, or might take a few more seconds. But in any case it will be super fast. Can you mix Smoothie Balls with just water? Yes, you can in theory. But if you mix a banana with just water it tastes less delicious than it could. Your smoothie will be creamier with milk or a milk alternative. When you want fewer calories, simply mix our Smoothie Balls with coconut water. It is easy and tasty. Don't smoothies contain too much sugar? Do Smoothie Balls still contain vitamins? Yes. The ingredients for our Smoothie Balls are gently processed and not heated above 42 degrees. This means that most of the valuable nutrients in the ingredients are preserved. So our Smoothie Balls are still a source of vitamins. Smoothie Balls will be back in stock shortly. Please submit your email address and we will notify you once the product is available again. For legal reasons we can currently only notify subcribers of our newsletter. Revolutionary quality. At a higher level. Send us a WhatsApp message. We look forward to hear from you!